Cuba history is filled with dramatic twists and turns of fortune. Indigenous peoples inhabited Cuba as far back as 3,500 years ago. They had travelled from the South American mainland and across the Caribbean islands. The early settlers were hunter-gatherers. Then came a tribe who were farmers and fishermen. These groups were displaced by the Tiano--who were fleeing from Hispaniola and from the ferocious Caribs--from the 12th century onward. The Tiano lived in large family groups in circular thatched huts designed to endure the worst tropical storms. They lived peaceably in a land where you only need to drop a seed and it grows rapidly. Fruits, vegetables and corn came in abundance, supplemented by fish and wildlife. The Tiano were weavers, potters and boat-builders. They were a compassionate people who looked after the sick and less able among them. Their world changed on the evening when Columbus first set eyes on Cuba. 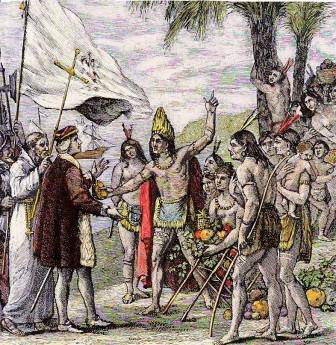 Columbus noted that the natives were gentle, loving and without guile. The Spaniards would soon take every advantage of this. In 1511 four ships arrived from Spain carrying the first 300 settlers, led by Diego Velazquez de Cuellar. He chose Baracoa and within a few years this soldier had also established settlements in Bayamo, Camaguey, San Cristobal de la Habana, Sancti Spiritus, Santiago de Cuba and Trinidad. The Spaniards were on a ruthless crusade in search of spices, gold and precious metals. 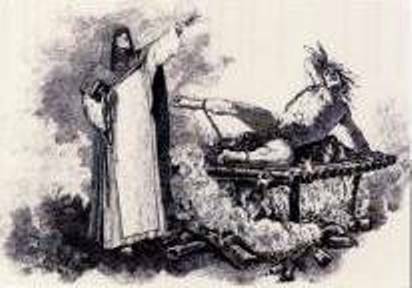 They considered the natives as backward infidels and were ordered by the Pope to convert them to Christianity. Native men, women and children could be put to the sword by the hundreds, on a whim. After all, they didn’t have souls. A Catholic priest asks the Indian resistance leader, Hatuey, to convert before he is roasted alive. Hatuey refused. Though slavery had been forbidden by the Pope, a way was found around this. Spain divided up the land to its conquistadores. Each owner was then given command of from 40 to 200 Indian laborers who were worked to death in mines and on plantations, supposedly in return for being taught the scriptures. The Indian population rapidly disintegrated so that at the end of the 16th century they were extinct. Those not worked to death or victim of the sword fell from the white man’s cornucopia of diseases to which they had no immunity; TB, smallpox and measles took them away. Cuba never had the wealth of gold and silver found in the South American territories. But it did have geographic advantage. The Spanish galleons--filled to the brim with the riches stripped from the Americas--needed a place to replenish and rest on their long journey back to Spain. Cuba held that very position and more precisely, Havana’s protected harbor was what they needed. Havana became the capital in 1607 and so began a new political structure to the other island towns which established municipalities and town councils. Ship building meant the felling of the majestic forests, but this in turn made room for cattle and tobacco. All of this bounty, including the hardwoods, was shipped to a voracious market in Europe. Once the natives had been killed off, the landowners looked to Africa for its labor. Cuba quickly grew extremely wealthy. Slave traders, plantation owners, merchants and smugglers benefited from an explosion in demands for their goods. So great was the bounty that from 1537 pirates began to sack and plunder Cuban towns and villages, as well as ships. The Governments of France, Holland and England encouraged their pirates to go for the gold. For much of the 17th Century, following the devastating loss of the Spanish Armada off the coast of Ireland, pirates freely preyed on Cuba and the Spanish fleet, putting a great dent in the economy. The kings of Spain treated Cuba as an endless source of easy profit. They demanded a monopoly on all trade between their countries, so they could buy cheap and sell the goods at inflated prices to Europe. These were tough times in Cuba history. In 1762 a British armada of 200 shops conquered Havana (and so Cuba) after a 44 day siege. They opened the island up to free trade, including trade in slaves. Suddenly the economy once again skyrocketed, with foreign ships filling the harbor to empty their wares and taking back tobacco, wood and sugar. After one year England came under pressure from Jamaican planters to give up their new colony as they didn’t want any competition in the lucrative sugar trade. So England swapped Cuba back to the Spanish for Florida. The prosperity continued as King Charles III of Spain kept the free trade policy, and then the United States began to trade directly with Cuba after their successful battle for independence. The world had a collective sweet tooth that would ensure unimaginable expansion of the sugar plantations of Cuba. This in turn meant an increasing need for slaves. The Cuban sugar business had another shot in the arm when Haiti gained its own independence in 1791 and halted much of its sugar production. Over 30,000 French planters moved to Cuba with their expertise. Thousands of slaving ships each year began to drop anchor in Havana harbor as the British supplied this much-needed labor. Things boomed to the extent that the city had a newspaper, postal service and had established a University. Cuba’s free citizens grew wealthy, largely on trade with the United States, and could afford to build monuments, parks, libraries and theatres. The problem was this... Spain gave favor to its own. All benefits and profits were geared to native-born Spaniards, called peninsulares, rather than to Cuban-born individuals. The Spanish authorities did this by taxing the Cuban people to the hilt and skewing laws. The result was that any hillbilly from Spain could take a ship to Cuba and lord it over the locals. travel without permission of the military. By the early 19th Century the young people were embittered and ready to act. They had been profoundly affected by the success of the American and the French Revolutions, not to mention that of their neighboring island, Haiti. As Spain lost colony after colony in the New World, she instigated brutal policies throughout Cuba to keep the people down.